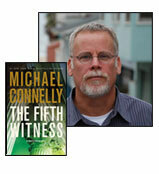 Michael Connelly's latest legal thriller, THE FIFTH WITNESS, has been named the winner of the Harper Lee Prize for Legal Fiction. Connelly will be honored at a ceremony and panel discussion on September 20, 2012 at the National Press Club in Washington, D.C., in conjunction with the National Book Festival, sponsored by the Library of Congress. The Harper Lee Prize for Legal Fiction was inaugurated last year by the University of Alabama School of Law and the ABA Journal, to celebrate the 50th anniversary of Lee's classic novel TO KILL A MOCKINGBIRD (Lee was herself a former Alabama law student). The Prize, authorised by Lee, is given annually to a book-length work of fiction, published in the preceding year, that best exemplifies the role of lawyers in society. John Grisham received the inaugural Harper Lee Prize for Legal Fiction in Septemer 2011 for his work in The Confession. THE FIFTH WITNESS was chosen as the winner by a selection committee that included New York Times bestselling novelist Linda Fairstein, former US Secretary of State Condoleezza Rice, New York Times bestselling Novelist Lisa Scottoline, NPR Legal Affairs Correspondent Nina Totenberg, and FOX News Political Analyst Juan Williams. Connelly and his work will be featured in the ABA Journal and honored with a special edition of To Kill A Mockingbird, signed by Ms. Lee. 'Lincoln Lawyer’ Mickey Haller, who’s happy to use a few tricks to help clients facing the might of the state, has been hit hard by the recession; he’s now defending clients more from mortgage foreclosures than criminal charges. But then an outspoken protestor is arrested for murdering a bank CEO, and Haller is back in criminal court, fighting a case that will cause him to reexamine everything. A legal thriller about much more than its plot, Connelly shows once more that he’s right at the top of the crime writing tree. You can also read my large New Zealand Listener feature on Connelly, where we delved into the character of Mickey Haller, among many topics, here.